This year NAEA hosted its 72nd art education convention in Boston, MA. The convention started on March 14th and ended on March 16th. 5,500+ art educators from across the globe were at the convention. This convention was intense with 1,000+ engaging and informative sessions, workshops, tours, events, exhibits designed by and for art educators, and the exhibitors such as Davis Publication, Jack Richeson and Company, Royal Brush, AMACO, Blick Art Materials, etc. Since 1947, art educators have provided leadership that has shaped the field of research and practice in art education and positioned NAEA as the premier professional community for our field. NAEA is committed to supporting art educators in their quest to excel as leaders. The NAEA National Convention, state and regional conferences, special programs and events explore the multi-faceted roles of the art educator through the prism of knowledge, understanding, and leadership. Throughout the convention I snapped a few photos (actually a lot of photos). Here are a few of my favorite photos and video of artist Amy Sherald talking about her commissioned painting of Michelle Obama. This convention was magical and rejuvenating for the creative soul. Please note: This video was recorded from the balcony level. Artist Amy Sherald spoke to a full house. Pick up your copy of the April 2019 issue of SchoolArts Magazine at Barnes & Noble. Artist Amy Sherald was interviewed by SchoolArts Magazine editor, Nancy Walkup. Artist Amy Sherald was NAEA’s opening keynote speaker. NAEA Is a great place to network and connect. Almost time to visit the exhibitors. Art teacher, Jonathan Fritsch, and I took some time to do a little bit of sightseeing. We walked on the campus of MIT, took the T to Chinatown and Southie, stopped by Graffiti Alley, and visited the MFA. No longer tourists. Whatever it takes to blend in. In 2018, I joined the NAEF Board of Trustees. Being a 2015 recipient of the Mary McMullan Grant for a project I created, “The Midwest Artists Studio Project”, I was appreciated of the financial support for the work I was doing to create innovative lessons based on Midwest contemporary art practices designed to engage and inspire my art students. Being on the other side of this experience has given me more of an appreciation for the work that NAEF does to invest in innovative initiatives to support instructional practice, research, and leadership in visual arts education. As an independent, philanthropic organization, the National Art Education Foundation (NAEF) supports a wide variety of professional activities, including support for visual art educators to participate in professional development programs; the promotion of visual arts education as an integral part of the curriculum; the exploration of new models of visual arts instruction in public and private K-16 schools; the promotion of the teaching of art through activities related to the instructional process, curriculum, student learning, student assessment, management, or discipline; the purchase of equipment and/or instructional resources; and conducting research in visual arts education. NAEF has supported 316 projects since its inception in 1985. NAEF is a sister organization to the National Art Education Association (NAEA) and provides support for a variety of visual arts education programs for the Association and its members. Flashback: As I reflect on the past 17 years of being an art educator I clearly remember not being encouraged by my teachers or professors to follow my dreams or interests. Not sure why. I have always been a great student. It was not until I graduated from Carroll College (now Carroll University) and applied for several entry level graphic design jobs that I decided that I did not want to become a graphic designer. So what does a college graduate do to seek advice about life after college? I ended up going to Barnes & Noble to find the answer. I came across a book called, “What Color is your Parachute?” by Richard N. Bolles. I stumbled upon two questions. What skills do you have? Where would you like to use those skills? My answers were art and classroom, respectively. It was then that I decided that I wanted to become an art teacher. I often get asked why I wanted to become a teacher by students. I became an art teacher because I want to encourage them to pursue their dreams, to guide them during their high school years, to be there for them after they graduate, and of course, to share my love for art, art education, and advocacy. I share this story because we, art educators, can and do make a difference in the lives of our students. When we invest in our students we guide them into a path of success. Every student has a unique story and it is our responsibility to find ways for them to blossom. Teaching art is a complex system that others may not fully understand, which is why we need to continue to advocate, promote, and create an awareness of the importance of Art Education. Being named the 2019 National Secondary Art Educator of the Year is one of my proudest moments in my professional career. I have to give a shout out to my WI crew. I had my first taste of presenting at the National Art Education Convention in 2014 in New Orleans. I could not believe my eyes when I received notification that my presentation was accepted. Since then I have been presenting about every other year. Presenting at the national level has been such a great way to talk about our art program at Sheboygan North High School and how it continues to empower our student population both in and out of the classroom and to contribute to our school’s culture. What people may not realize is that prior to 2014, I have applied every single year from 2008 and was rejected every single time. Persistence does pay off. Program highlights: In 2010, we have created an artist lecture series. In 2014, we created our NHS ARTifacts Gallery and the NHS Artist-in-Residence Program . In 2015, we had one of our student’s work published in SchoolArts Magazine . Since then we’ve been contributing more student art and art education articles. The best advice I can give to art educators is get out there and make things happen. 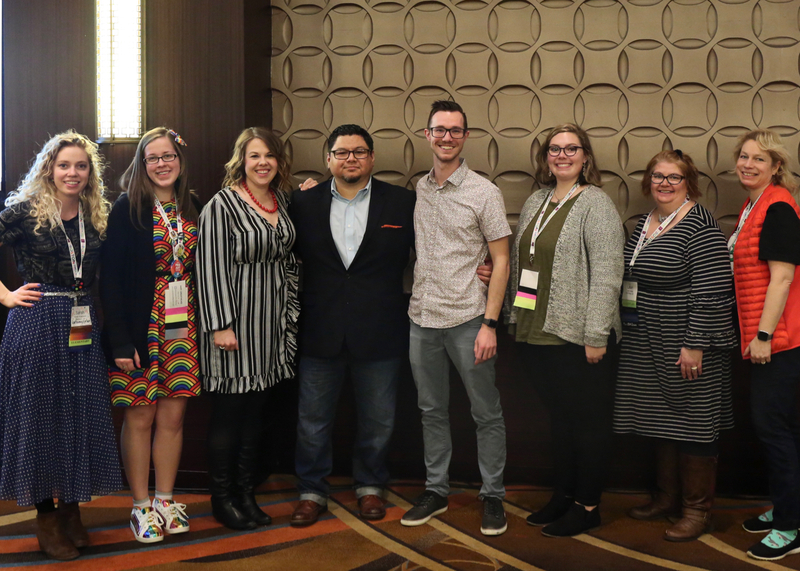 Tap into your local art resources, invite artists into your classroom, write articles, submit a proposal to NAEA’s 2020 Convention in Minneapolis, talk about the business side of art with your students, and use technology as a way to connect your students to an amazing art world that exists outside your classroom. Not sure how or where to start?